A 130-piece puzzle, measuring 400 x 280mm. A 130-piece personalised jigsaw puzzle which can be completed more quickly than our larger puzzles. Ideal for children or for adults where a quicker solution is required. Made from top-quality Daler Rowney artboard, these puzzles measure 40 x 28cm and are delivered to you in a sealed, clear bag in a smart, black gift box (175 x 125 x 37mm) with an optional picture on the box lid. Because a lot of our puzzles are given as surprise gifts, we don’t automatically include a copy of the picture on the box lid. However, if you would like us to do this, just let us know when ordering – there will be a small additional charge of £1.50. 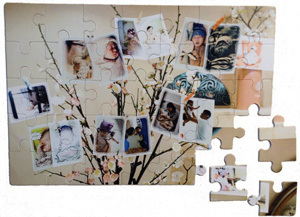 400 x 280mm puzzles are an ideal format for personalised jigsaw puzzles because most digital images will enlarge successfully to A3 without losing definition, and the puzzles can be completed on a large tray, making them easily manageable.